A pond filter is composed of different filter material. Its quality determines whether filtering occurs correctly and consequently how clear your pond will become. The right combination of filter materials in your filter is therefore essential for a health pond! Visible dirt should be sieved out of the water. Invisible dirt and organic waste material should be converted into harmless material. Reason why filter materials are divided into two kinds. Mechanical filtration and biological filtration. In case of mechanical filtration the filter stops dirt and in case of biological filtration dirt is decomposed by bacteria. A proper filter is composed of several filter phases and different kinds of filter material. The initial phase of your filter always contains the mechanical filtration because here the visible dirt is sieved out of the water. Biological filtration always occurs in the second phase. Here the invisible dirt is decomposed and converted into harmless or useful matter. In the last phase you can also make use of biologic filtration, however, you can also apply so-called chemical filtration. This kind of filtration will see to it that the finest dirt particles, aroma substances and colourings will be absorbed. It will be clear that for each phase you need different kinds of materials. Filter foam and filter cotton are ideal for mechanical filtration. Strong nylon fibres remove coarse dirt from pond water. For biological filtration it is quite convenient to apply filter lava. This is perfect for bacterial decomposition of invisible dirt and harmful matter. 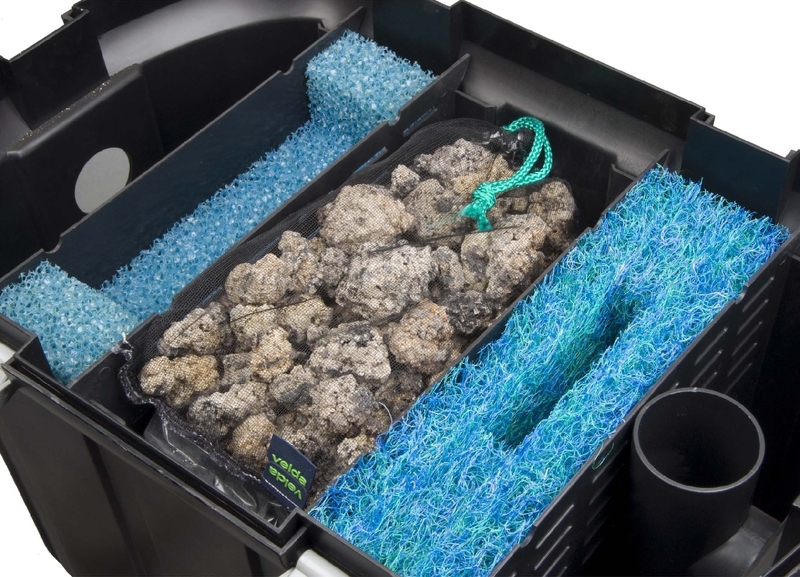 Activated filter carbon and zeolite will absorb the finest dirt particles, including aroma substances and colourings. This is also referred to as chemical filtration and therefore it should be used in the last phase of a filter.